It is generally no great task to assign these illuminated Books of Hours to a particular country or period. The treatment of the ivy spray with the single line stem and rather sparse foliage is characteristic of the work of the French monastic scribes about the year 1450 A.D. The occasional appearance of the strawberry indicates that the illuminating was done by a Benedictine monk. Fifty years earlier the stem would have been wider and colored, and the foliage rich; fifty years later the ivy and holly leaves would be entangled with flowers and acanthus foliage. This leaf allows us to see the dramatic difference between the size of a text block and the size of a leaf. The text block is ruled in red. Text: Based on the leaves we have seen, this Book of Hours accords with the Use of Rome. 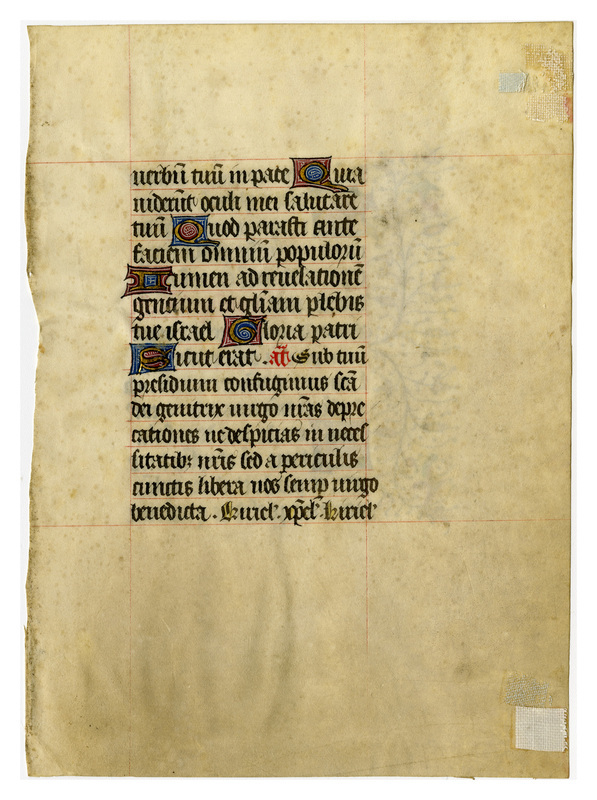 This leaf contains text from the Hours of the Virgin at Vespers or Compline, including the Song of Simeon from Luke 2 (recto). [Luke 2] ...thy word in peace. Because mine eyes have seen: thy salvation. Which thou hast prepared: before the face of all peoples. A light to the revelation of the gentiles: and the glory of thy people Israel. Glory be to the father. As it was in the beginning. Ant: Under thy aid we make our refuge O holy mother of God: despise not our petitions in our necessities but deliver us ever from all dangers O glorious, and blessed virgin. Lord have mercy upon us. Christ have mercy upon us. Lord have mercy upon us. O Lord graciously hear my prayer. And let my cry come unto thee. Let us pray. We beseech thee O Lord that the glorious intercession of the ever blessed, and glorious virgin Mary, may protect us, and bring us to life everlasting. Through. For all the saints. Ant: O all ye saints of God vouchsafe to make intercession for ours and all others salvation. V: Be glad in our Lord, and rejoice ye just. R: And glory all ye right of heart. Recto Transcription: verbum tuum in pace. Quia viderunt oculi mei: salutare tuum. Quod parasti: ante faciem omnium populorum. Lumen ad revelationem gentium: et gloriam plebis tuae Israel. Gloria patri. Sicut erat. Ant: Sub tuum praesidium confugimus sancta Dei genitrix: nostras deprecationes ne despicias in necessitatibus: sed a periculis cunctis libera nos semper virgo gloriosa, et benedicta. Kyrie eleison. Christe eleison. Kyrie eleison. Domine exaudi. Et clamor. Oremus. Beatae, et gloriosae semperque virginis Mariae, quaesumus Domine, intercessio gloriosa nos protegat, et ad vitam eternam nos perducat. Per. De omnibus sanctis. Ant. Sancti dei omnis intercedere dignemini pro nostra omniumque salute. V: Laetamini in Domino, et exultate iusti. Et gloriamini omnes recti corde. Oremus. 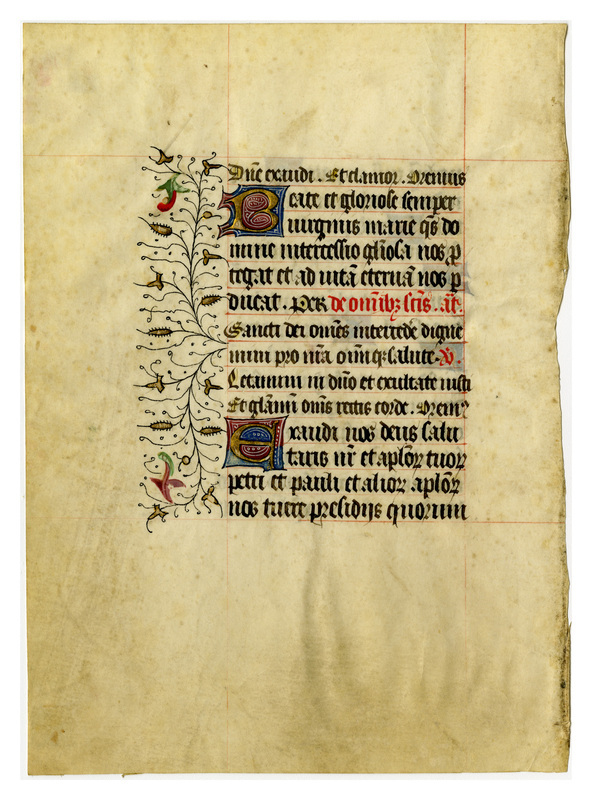 “E0029 Leaf from a Book of Hours (Horæ Beatæ Mariæ Virginis),” Digital Exhibits | Denison University Archives & Special Collections, accessed April 23, 2019, http://exhibits.denisonarchives.org/items/show/51.